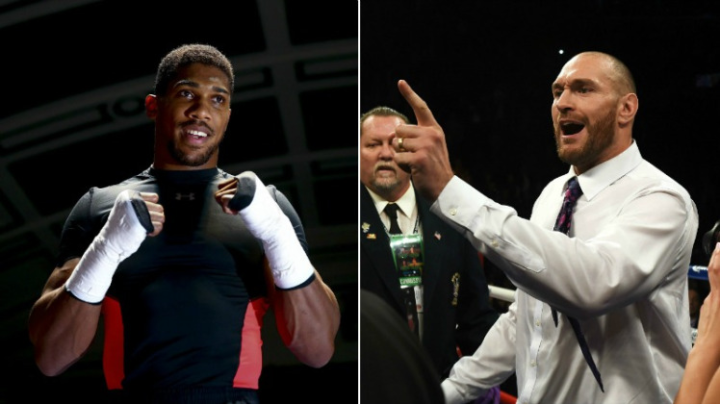 ANTHONY JOSHUA is a more realistic opponent for Tyson Fury than Deontay Wilder. That’s the surprising verdict of Fury’s trainer Ben Davison. The Gypsy King climbed off the canvas in dramatic fashion to earn a split-decision draw against WBC heavyweight champion Wilder back in December. Many felt Fury, 30, did enough to claim victory out in Los Angeles and an immediate rematch was demanded by fight fans across the globe. However, the Brit’s decision to sign an £80m five-fight deal with ESPN blocked that follow-up bout from happening - with Fury now set to take on the little-known Tom Schwarz and Wilder locking horns with fellow American Dominic Breazeale. Of course, unified heavyweight chief Joshua is also in the equation, and Davison believes Fury is more likely to face his domestic rival before a rematch with Wilder takes place. “Tyson’s shown that he will always step up to the mark and take the risk. Who else has done that out of them two [Wilder and Joshua]? Nobody,” he told iFL TV. “When you discuss with [Wilder’s team] about coming to us, the conversation goes dead. But hopefully we can get those fights made. “At the end of the day, they was trying to negotiate with Wilder’s team, it didn’t look like that we was gonna be able to get them on our platform right away so we couldn’t afford to sit still and we had to get something done. Fury has drawn plenty of criticism for his decision to take on Schwarz in Las Vegas on June 15. Despite winning all 24 of his professional contests to date and being ranked number two in the world with the WBO, the German is fairly unknown and is unlikely to provide any real threat to the former unified heavyweight king. But Davison says Schwarz was picked largely because of his height. “A few names got sent across and we had a look,” he said. “Obviously we don’t want to make the adjustment of somebody big to somebody small, to have to go back to somebody big. “’Cos the other two elite fighters that we’re looking to make fights with are obviously six foot six plus.